I’ve got a strange feeling of déjà vu here. Although the Peugeot 4007 is a new car, it’s as if I’ve already driven it. 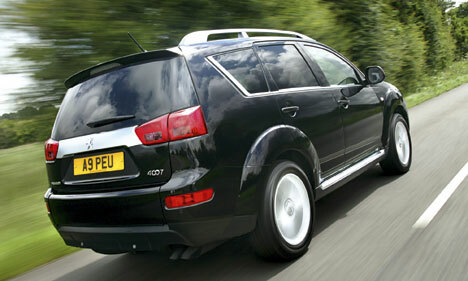 That’s because the 4007 is essentially a Mitsubishi Outlander with new clothes, or a re-nosed Citroën C-Crosser. But this is not meant to be dismissive. This badge engineering approach makes perfect sense for Peugeot and Citroën, companies with no heritage in the off-road market. With SUV sales booming across Europe (up 19% on the continent from January to June this year), Peugeot decided it wanted to grab a piece of the action but couldn’t justify developing its own SUV in-house because of the costs. Step forward Mitsubishi, a company rich in off-road credentials, and willing to set aside some of its Japanese Outlander factory’s capacity to build a few French-specification models. Essentially, this involves grafting new front and rear ends on to the cars, which in the 4007’s case is a prominent lion badge on the bonnet and a gaping silver grille with a clumsy bumper bar protruding from it. Where the Peugeot (and Citroën) scores is under the bonnet thanks to the 2.2-litre HDi turbodiesel engine. With 156bhp and smooth refinement it completely outclasses the noisy 2.0-litre Volkswagen diesel in the Outlander. Peugeot expects to sell around 1,500 4007s in a full year. Prices range from £22,790 to £25,490, exactly the same as the C-Crosser, although in residual value terms. CAP values the Citroën more highly. It expects the C-Crosser to retain 39% of its cost new after three years/60,000 miles, while the 4007 will hold on to 38%. CAP puts the Outlander between 38 and 39%. Behind the wheel Apart from the lion logo on the steering wheel, the interior of the 4007 is pure Mitsubishi Outlander. That’s no bad thing as the Japanese model has a simply-styled cabin that uses decent quality plastics. There’s plenty of space inside, although the third row of seats are strictly for children, and it also drives well for a vehicle of this type. There’s little in the way of roll in cornering, the diesel engine is smooth and noise levels from the engine bay and tyres are well suppressed. While not a true mud-plugger, the switchable four-wheel drive system allows the 4007 to cope with slimy mud paths or loose gravel roads with a degree of composure. Good to drive, refined, well built and generously specified – the 4007 should meet Peugeot’s expectations of finding 1,500 buyers in the UK next year with little trouble. However, it is expensive and there’s some serious competition at this price level, notably the (admittedly five-seat) Land Rover Freelander and Honda CR-V.